Once again I have wandered off the ancient Roman historical fiction reservation although in this multifaceted tale there is an element of alternate history in regards to The Roman Empire. Before the collapse of the Western Empire and the Ottoman victory in the East, a group of Romans comprising twelve of the oldest families leave Rome and setup a new country in the region between Italy and Austria, Roma-Nova and it has survived into the 21st century. Karen/Carina/Cara/Pulcheria is living an unassuming life as an office cubicle worker when she is suddenly thrust into a maelstrom of danger and intrigue. Her journey to a new land, a new culture, a new life is the basis for this wonderful book. This story has elements of history, romance, international and political intrigue, rogue/shadowy covert agencies, a coming of age/coming to grips with the reality of who you are, a really nasty bad guy; a wealth of plots to keep you entertained. The action is plentiful, the emotions are highly charged and the characters are full of life. The journey of turning Karen into Carina is not an easy one but is done in a most entertaining fashion. Of course she is helped along by a great supporting cast especially her nemesis, a member of a covert intelligence agency who plays a kind of counterpoint to Carina’s growth and finding herself; as his chief mission in life is to destroy her. Some nice plot twists as the story progresses enhance the excitement. It’s nice to occasionally wander away from the familiar and comfortable; even more so when the author produces an itinerary as fun to read as Inceptio. I am looking forward to delving into the sequel, Perfiditas. 4 stars. 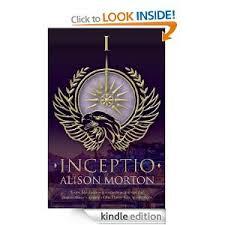 I’m Alison Morton and my first novel, INCEPTIO, an alternative history “what if” thriller, was published in March 2013 by SilverWood Books. It’s the story of a 25-year-old who crosses cultures, battles with an entangled emotional life and faces a relentless, vindictive pursuer. On the way she finds out quite a lot about herself. So what makes my book gripping, page turning, a ‘good read’? – The ordinary person baffled and menaced by an unknown outside threat. Who is this guy who wants to destroy her? – An alternate timeline of history. How would a small colony surviving from antiquity change the world? Up to now, most of my published writing output has been about France, property, business and translation. After selling my translation business at the end of summer 2009, I started writing my first Roman novel. I’ve always been a ‘wordsmith’. Translating professionally for much of my career has made me pretty nit-picky about words, grammar, punctuation, document cohesion, theme and structure. Oh, the qualification stuff: BA in Modern Languages Studies (French, German and Economics), post-graduate Diploma in Translation (Business & Legal options), MA in History (with a distinction!) and Member of the Chartered Institute of Linguists. I’m a contributor to the Alternate History Weekly Update a site I thoroughly recommend – it’s friendly and knowledgeable. I joined the Romantic Novelists’ Association under the New Writers’ Scheme in 2010 and have found it supportive, collegiate and brimming with knowledge and experience. The July 2010 conference was not only good for the famed parties and networking opportunities, but above all for the wealth of high quality talks and workshops. Ditto the July 2011 one, but I added in quite a bit of Roman exploration while I was at Caerleon. I completed a six day writing bootcamp in June 2010 at the Circle of Missé and a week’s Arvon Foundation course on popular fiction in October 2010 followed by taking part in the Festival of Writing at Yorkin March 2011 and the Historical Novel Society Conference in London in September 2012. I moved to France in May 2010 but as all my friends and colleagues know, I’m always back and forth to the UK.